Okay, so I got to go from my VTR to Murray's GSX-R and back again in one little ride, so what's the difference? What do I think? Well it was a pretty quiet little potter on the GSX-R but it was definitely nice to ride her again. Firstly the riding position: they are both quite similar in that they have that sport's bike crouch but the on the GSX-R this is more pronounced and your feet are much higher and the bars are a bit lower. To me this makes the VTR just that little more comfortable and the better bike for longer distance rides - not something that either of them are really designed for. What about the donks? Well, obviously this is where the differ the most. The VTR with it's 110hp V-twin and the GSX-R with it's larger 4 cylinder breathing with the aid of Yoshimura jets & headers and bellowing out of one of Brendon's Pro-muff mufflers - you've gotta be looking at somewhere around 140hp I guess. The GSX-R also makes do with one gear less than the VTR and is designed to be revved a bit more than the twin. Cruising along the GSX-R feels every bit of the extra 30-40kg it has over the VTR but this is not a bad thing. I'm now pretty used to riding heavy beasts and they tend to feel a lot more planted on the road. This extra weight and what is probably better suspension than the VTR would probably make the GSX-R better behaved in bumpy corners and also perhaps a bit safer in the wet. Overall it felt great motoring down the road and was a lot of fun to ride. Looks? Well, judge for yourself but personally I like the look of both of them but think that the GSX-R is showing it's age very gracefully and is still a great looking bike. I'd also have to say it's a better looking bike than the newer GSX-R1000's and Murray has truly kept this one in as new condition. So would I have one? Well, if I was a zillionaire with a big shed (or sheds) it'd be great to own a truly classic superbike but I'm not and can only just justify the two I've got now. So if I could have had the VTR or the GSX-R for the same money? A tricky question but I think I would still have taken the VTR. Already having a four in the shed it is really nice to have something else which is totally different and that v-twin just puts a big smile on your dial! The weather has finally taken a turn for the better and both days of this weekend have been rain free! I didn't get out on the bike yesterday but today had the chance to head over to Wanganui to participate in a Charity Ride (raising funds for child cancer) organised by the local Triumph owner's group. As this was only to be a short ride both Brian & myself left the Connie's in their respective sheds and I broke out the Honda while Brian pinched his brother's GSX-R1100. We headed off from Palmy just after 8:30 and took it quietly on the main road over to Wanganui - me keeping an eye on the fuel gauge as I'm still not sure about the ultimate range of the VTR. In the end I made it to Wanganui ok (after the fuel gauge had dropped to it's last mark) and put in just under 14L. We had a quick drink in town before heading to the Caltex service station where the ride was leaving from. There were already a heap of bikes there and upon registering I was about the 95th rider to register. In the end I would say that well over 100 bikes attended - the nice day must have helped! Leaving Wanganui we made our way back towards Palmy on the main road before turning off into the Turakina Valley. There's some great roads out the back here (although watch for the one's that turn into gravel) and we even took a couple that I had not ridden before. Eventually we popped out onto the main road just south of Ohingaiti where the ride ended for lunch and prize giving. Pemberton before heading home via Kimbolton etc. The road through here was pretty good considering the foul weather we've been having but there were still plenty of places to watch for gravel - not to mention two slips across the roads. The ride back from Pemberton to Kimbolton was truly awesome with me tagging in behind Brian for a while before eventually passing him just before Kimbolton. At Kimbolton we stopped briefly to wait for some cyclists to go past and from here on I was lucky enough to bring the GSX-R home. Fantastic to have the good weather back - looking forward to some great spring riding! Check out this link: http://www.advrider.com/forums/showthread.php?t=303243. 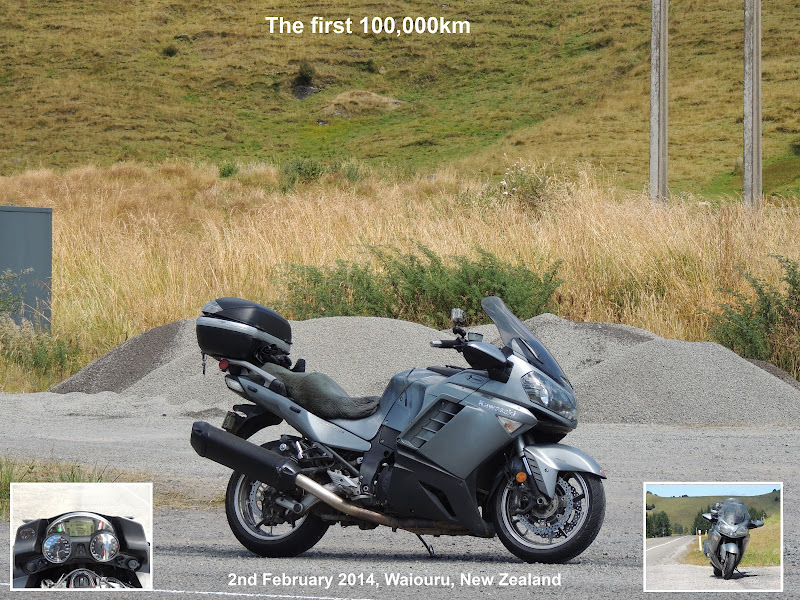 An awesome write-up from an Aussie touring the back roads of the South Island. Gets ya all very keen! With the GC coming up in just a month or too I thought that it was a good idea to think about a bit of extra light for the Connie. 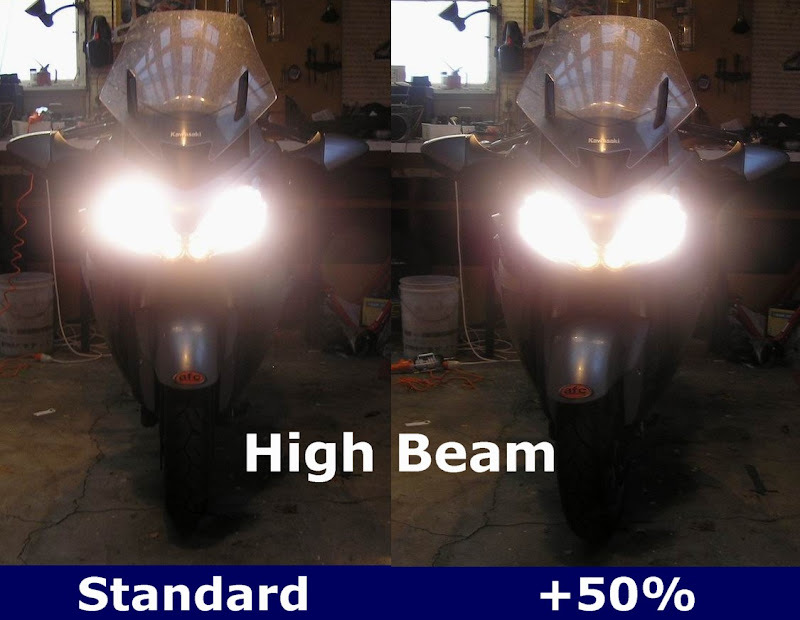 The standard lights are pretty good on high beam but perhaps not so good on low beam. 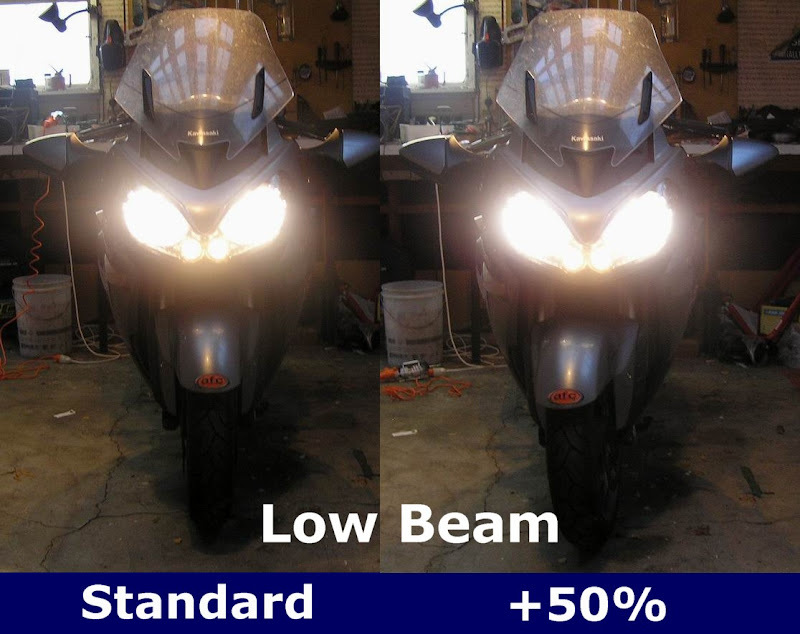 I ended up fitting some +50% bulbs which as the name suggests are supposed to give about 50% more light for the same wattage. They were really easy to fit compared to the mission it's been on some of my other bikes and I was keen to try to get some pictures of any difference in light output. Well, me for one! You definitely miss them when you haven't got one (I'm talking about the VTR here) and they make the little jobs a lot easier. So I got me some stands and they seem to do the trick just fine. Were pretty cheap too - got them here. The weather forecast was right - it was a cold night and the ground was definitely crunchy when I got up in the morning. But there was a ride on so thermals and extra layers were the order of the day. The plan was a clockwise loop from Palmy to Taupo and back through Napier with the normal pitstops for gas, food and coffee. I picked Mark up on the way out to Ashhurst where we met up with the rest of the local gang. From Ashhurst we headed through to Colyton before tackling Vinegar Hill. As it was a bit chilly and the roads were wet in places the pace was kept down so there was plenty of time to check out the scenery - everything nice and green in the bright sunshine. Another quick stop in Waiouru to top up the tank on the littlest Ninja and were off onto the desert road proper. With clear skies the scenery was just fantastic so we had to take advantage and stop for some piccys and to throw some snow around. Leaving Taupo we took it pretty quietly across the plains and eventually caught up with a group of BMW riders - one rider we recognised as "Folker" who we had met on the Southern Cross & Grand Challenge (he did his first GC at 70). We eventually past them to enjoy the more spectacular parts of the road. Superb riding conditions and a superb road - who could ask for more. At Napier we carried on without stopping and headed south on highway 50. Another great ride through here although we had to avoid another cop who was hiding in a particularly devious place - luckily oncoming cars gave us plenty of warning. Back out onto highway 2 we settled into a gentle cruise home - the only other bit of excitement was a car nose into a ditch just north of Woodville. No idea how it managed to end up there but there must have been some injuries as we caught up to the ambulance in Woodville - hope nothing to serious. The VTR - What's it like? Okay, so I'm back from my first decent ride on the VTR and what do I think? Well firstly, I'm writing this as someone who has not really ridden a lot of sports bikes. I've mainly been on sports-tourers (and some say that that is what the VTR is - not me though) and tourers. I am not used to the ride position or the V-twin (only ridden V-twin cruisers) so she's all pretty new to me. Obviously the first thing I noticed was the size coming off a 280kg Connie. The seat height is about the same as the Connie although the bike is a lot skinnier so it is easier to touch the ground. The bike is light - it feels like a 250 or some toy after the Connie. Pushing it around, getting it in and out of the shed etc is a piece of cake. The ride position is definitely different to the Connie with the low, narrow clip-ons you feel like your chin is hovering just over the front mudguard. Around town I'm getting sore wrists but don't have the problem once on the open road. The seat is firm but surprisingly comfy - after over 350km my backside was still all good. The aftermarket screen is also very good - with earplugs there is actually less wind noise than on the Connie with the screen full up. Weather protection is obviously not in the same league though and I felt the breeze on my legs and got a tad damp in the wet weather towards the end of the ride. but in the mix of riding we did yesterday I got between 6.5-6.7L per 100km - not as good as the Connie but then the bike is working a bit harder for it's living. Handling? Ok, I'm still coming to grips with this. Initially I was riding on some pretty slippery roads on new tyres so a bit of care was required - a few little slips here and there but she behaved herself. Later on when on some nice dry roads it was easier to push things a bit and the bike just ate the corners up. The tyres also got nicely scrubbed and worked well in the rain later on. The ride is a bit firm but you forget this once the pace is up. Being a light bike the bumpier corners need to be treated with a little more respect. Interestingly given the weight difference the bike does need more rider input than the Connie - especially into slower corners. The difference here is the wider bars on the Connie requiring less effort and I guess that sports-bikes are designed to be ridden hard. Steering lock is pretty average with hands being squished into the tank at full lock - pretty typical problem with narrow clip-ons. Range - it'd be nice to be able to do 300km to a tank. Not going to happen and I can live with it because I have the Connie. No centre-stand. Oh, that's right it's a sports-bike. Might have to get some stands for cleaning, maintenance etc. Noise. It'd be nice if she made a bit more but this is getting more unpopular these days so I dunno. I thought bar-risers might be a good idea especially around town but I'm not so sure now - the screen works really well and sitting higher up might wreck that. Brakes. Not in the same league as the Connie but I'm getting used to them and they are nice and progressive. One thing to watch carefully when swapping between bikes. It had to be done - sod the weather. Yep, a great ride on the new VTR today along with Sarge on his FZ-1 and the Yods on their Blackbird. We met up in town and headed out into some pretty grey looking weather. A quick blat over the Pahiatua track (which was fun even though the road was wet) and I was starting to get to know the bike a bit more. Out the back of Pahiatua the roads were wet and quite greasy in places, not to mention the slips and even tree branches over the roads so some care was needed. A quick stop at Alfredton for some piccys (and for me to rave about v-twins) before heading into Masterton to top up fuel tanks. From Masterton we headed out the simply delicious Castle Point road and even though there was storm damage & road works in places the ride was fantastic with mainly dry roads and plenty of fantastic curves to enjoy. One particular piece w here a slip had been cleaned up was quite muddy and I didn't quite slow up enough to avoid wearing a mist of mud from a certain Blackbird - quite a laugh when we stopped at Castle Point. After a bite to eat we were forced to turn around and head back towards Masterton. On this leg I tried to stick behind Sarge he started to attack the corners. Had an absolute blast but was eventually left in his dust. have bothered, should have made it home ok. Anyway, we said our seeyas to Sarge at Pahiatua before heading back carefully over the track. Quite wet but it still didn't put a damper on an awesome ride. Great to get the first one under my belt and I certainly know the VTR a bit better now.